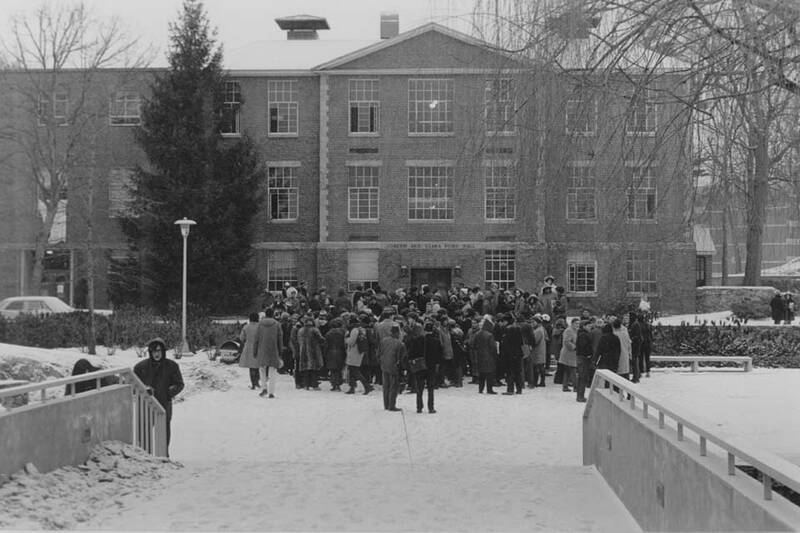 Students gather outside Ford Hall in January 1969. On Jan. 8, 1969, approximately 70 African-American students took control of Ford and Sydeman Halls. The students quickly presented the administration with a list of 10 demands for better minority representation on campus. Although the administration did not come to an agreement on all 10 demands, the students left Ford and Sydeman halls on Jan. 18, 11 days after the occupation began. The administration did grant most of the students amnesty and President Morris Abram stated that every legitimate demand would be met in good faith. Below is a basic timeline of events of the student occupation. The Robert D. Farber University Archives & Special Collections Department website has the text of the 10 demands as they were published in The Justice, the main student newspaper. The website also provides a bibliography of sources and a gallery of photos of Ford and Sydeman Halls during the occupation (see left sidebar of this page). The Justice articles from 1968 through 1970 serve as the sources for this timeline. This is a basic outline of the events of the student occupation. The Rev. Martin Luther King Jr. is assassinated. In response to the assassination of Dr. King, the Brandeis Afro-American Society makes a proposal for how the university should respond. The proposal includes the active recruitment of more black professors and students and the development of an Afro-American studies department. The administration establishes 10 Martin Luther King Jr. Scholarships. First Transitional Year Program (TYP) class meets under the direction of Professor Jacob Cohen. Morris Abram is officially inaugurated as the second president of Brandeis University. The faculty approve the African and Afro-American studies concentration. A white first-year student allegedly shoots a black TYP student in the cheek with a BB gun. The administration refuses to expel the accused until a formal trial is held. In the end, no student presses charges. Brandeis students Lloyd Daniels '69 and Sidney Blumenthal '69 and assistant professor of sociology Neil Friedman give presentations at Brandeis on a student strike being held at San Francisco State University. Friedman announces that he will strike for one week in sympathy with San Francisco State and asks the university to suspend his salary for that time. Wednesday, January 8, 1969, 2 p.m.
Sixty to 75 student members of the Brandeis Afro-American Society take over Ford Hall. The takeover starts in the switchboard room as 10 to 15 black students tell the two operators to leave the building. After the seizing the phone system, the students move throughout Ford, telling classes to vacate the building and instructing various personnel to leave. After the building is secured, students allow members of the press to go to the office of Lathan Johnson, the black student adviser, where the occupying students hold a news conference. At the news conference, spokesmen Ricardo Millet '68, the Ridgewood residence counselor, and Roy DeBerry '70, president of the Brandeis Afro-American Society, read a prepared statement and present the list of 10 demands, which they say is nonnegotiable. The spokesmen also call for a guarantee of complete amnesty for those involved in the protest. At 5 o'clock that evening, some of the occupying students hold a meeting in Mailman Hall to announce the reasons for the takeover. Phyllis Raynor ’69, a representative of the Afro-American Society, presents the group’s demands to let the white students to decide among themselves what type of support they wish to offer. A Justice article states that the black students realize they cannot be successful on their own and hope the white students will support them in some way. That evening, the administration and faculty hold emergency meetings. Dean of University Planning and Development Clarence Berger holds a news conference in the board of trustees office and reads a statement from the president. The document condemns the action of the black students and notes that their demands were never formally presented in their present form to any administrator. The faculty approves, by a vote of 153 to 18, a resolution condemning the black students' actions and calls for the students to leave the building and enter into negotiations. A faculty committee is appointed and enters Ford Hall to talk with the students. Approximately 400 students meet in Gerstenzang 123 to codify their opinion. A petition drafted and approved by a large majority of the students opposes the use of police, the takeover of other buildings and the use of force of any kind, and is in favor of keeping all channels of communication open. Some white students start a sit-in at the Bernstein-Marcus Administration Building in support of the black students' position. Members of the Afro-American Society rename Ford and Sydeman halls Malcolm X University. Some students begin a general strike in support of the demands of the black students, hoping to resolve the deadlock between the students and the administration. Twenty-two white students engage in a hunger strike in support of the black students. President Morris Abram announces that the black students are being held in contempt of a civil restraining order. The occupation ends as 64 students leave Ford Hall by a second-story rear fire escape without any substantive agreements concerning the 10 demands. However, the administration grants amnesty to the occupying students, with the exception of a few female members who remained in the building. President Abram states that every legitimate demand would be met in good faith. The faculty approves the African and Afro-American department. Ronald Walters is announced as chair of the African and Afro-American department.